Mantels are a perfect example of that one last thing you need to pull a room together. While their design is often subtle and unintrusive, the combination of form and function they can bring to a room of any size can be just the finishing touch your fireplace, den, or entire living room needs to really feel complete. Of course, the durable construction of fireplaces (typically using brick or stone masonry built into the wall) means you have to be a little careful when installing them, particularly if the mantel is floating, including cast stone mantels or wooden mantels. Take some time to carefully plan where (and how) you want to hang your mantel. 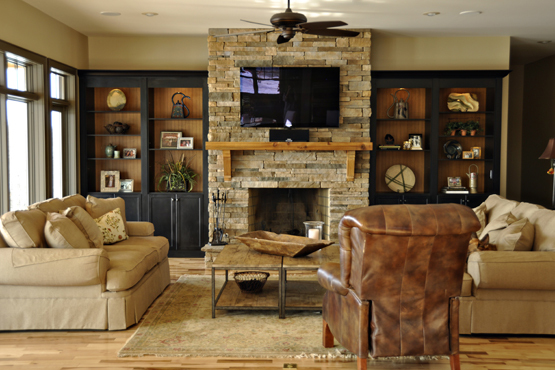 Are you going for the “right over the fire” look or do you want to put some distance between the fireplace and your shelf for aesthetic and/or safety reasons? Clearly mark and carefully measure the placement of your mantel before you start drilling. At each mark you just made (using chalk, ideally, as it’ll show up better on the brick or stone), drill holes using a ¾” masonry bit. On the bit itself, mark it at 3” so you know when to stop drilling (to avoid the holes being too big for the mantel brackets). Many mantels will have these holes pre-cut, but if they don’t you’ll have to cut them yourself. Mark the back of the mantelpiece with chalk or small bits of paint at each interval where the lag bolts will sit, and drill them carefully so you have enough room to lay them down. Finally, the step we were all waiting for: installing the mantel! Apply high-temperature silicone to the end of all the lag bolts and slowly work the mantel onto each bolt. Give the silicone some time to settle before you start decorating the mantel with any photos or knick knacks, and after this all you should need to do is kick back and enjoy your fireplace.